Author Michael Days is one of the guest speakers on Feb. 25 at the Les Gemmes Literary Luncheon. 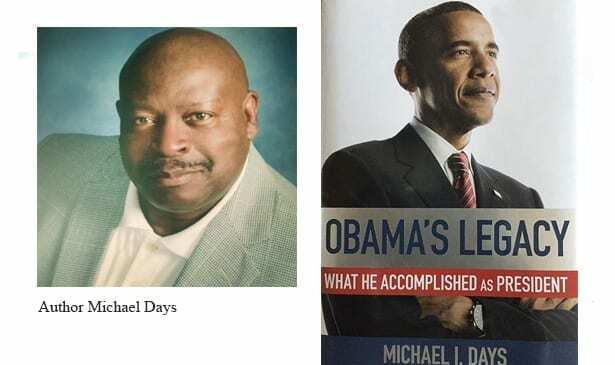 NASHVILLE, TN — Writing a book about President Barack Obama’s legacy was not really something Philadelphia Daily News Editor Michael I. Days had considered as the president’s second term in office was coming to a close. Every day Days was making decisions about the many stories going into the pages of the Pulitzer-Prize winning Philadelphia tabloid as well as those concerning the accomplishments of the country’s first African American president. But putting it all together hadn’t been a priority until his wife and editor, Angela Dodson, encouraged him. Obama’s Legacy: What He Accomplished As President was released in September 2016. Days will be the featured speaker on Feb. 25 at the 10th annual Literary Luncheon sponsored by the Nashville chapter of Les Gemmes, a women’s organization that mentors teenaged girls. Days added that now he is even more proud of the book given the outcome of the recent presidential election. “I would argue that President Obama’s legacy will definitely survive given what we see now,” he said. “There is something to be said for stability. “Ultimately, people want someone who looks presidential, who acts presidential. Historians will write about him five, 10 years from now and he will be looked at as one of America’s greatest presidents,” Days said. The book is beautifully illustrated with photos from President Obama’s time in the White House and quotes from speeches he gave during his two terms. He said he sometimes gets questions from African Americans who say President Obama didn’t do enough for the community. “And I say, are you in a bread line? Look at what life was like during the Depression.” If President Obama hadn’t turned it around, we would not be doing this well, Days said. “He is handing President Trump a country in better shape than what he was handed. He saved a million jobs,” he said. Even though efforts are underway to repeal the Affordable Care Act, Days said President Obama will always get credit for making insurance available to more people in this country. President Obama’s accomplishments also include better funding for HBCUs and My Brother’s Keeper, a mentoring program for young black men that he said he will continue to be involved in after leaving office.